Strada Security offers video camera solutions that will meet your needs. From motion detection, infrared, wireless doorbell camera, and much more, you can make your home or property safe. Cameras are an essential part of any security system. No matter what your needs are, Strada Security has a system that will meet them. Are you building a new home or remodeling? We can design and install a structured wiring system in your home complete with cameras and video monitoring. Have an existing home but looking to install a new system or enhance your current system? We can provide and install wireless and minimally invasive security systems. Cameras with motion detection kick on and start recording when motion is detected. You will be able to view camera feeds live from your mobile device. Integrate your home’s lighting system with your motion operated cameras – program your lights to turn on when motion is detected – even when you are away from home. And, of course, you are able to receive an instant notification when your cameras are activated. IR cameras are able to see in the dark. Even when your lights are off, IR cameras can record activity anywhere on your property. With pan and tilt cameras, you can control and change the angle and position of your cameras from the convenience of your smartphone. View live video from your mobile device, anywhere, anytime. See who is at your front door from your mobile device. The Skybell Doorbell Camera has a twoway voice microphone, a 1080p HD camera, and motion detection. You can communicate through your mobile device with anyone at your front door whether you are home or not. Learn more about the Skybell Doorbell Camera here. Unlike a DVR, the Alarm.com SVR will record video 24/7 for over 15 days. Your SVR is connected to your app, so you are able to review video data, make clips, and erase and manage data from anywhere at any time. Strada Security can install cameras anywhere on your property. 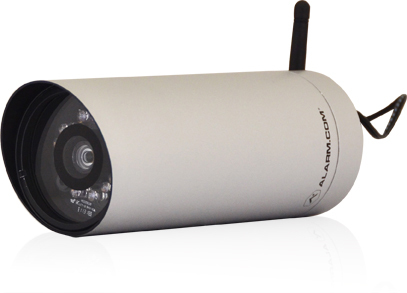 Indoor and outdoor cameras options are available and they can be wireless or hardwired depending on your needs. Call Strada Security today and schedule a consultation with one of our security experts.